#활성화 한다음 아래의 config 파일이 있는 디렉터리로 이동한다음 jupyter를 실행 해야 한다!!! # jemin_config.py는 SSL 설정을 Disable 한것이다. Ipython Notebook 보다 더 발전된 Interative IDE이다. Jupyter가 다중 kernel을 지원한다고 한다. 즉, python 2,3 모두를 지원 한다. 주피터의 다중 커널 개념 지원은 매우 간단하고, 강력하다. IPython이 실행되는 파이썬 실행기에 종속되지 않기 때문에, 다른 언어들의 커널을 지원할 뿐만 아니라, 환경만 갖춰져 있다면 같은 언어의 다양한 버전에 대해서도 별도의 커널을 만들어 사용할 수 있다. 나아가 파이썬의 virtualenv와 결합하면 환경별로도 커널을 분리해 사용할 수 있다. 이와 같이 다중 커널 개념은 Jupyter의 핵심 개념이며, 이를 통해서 좀 더 자유롭게 Notebook 생활이 가능해질 것이다. Click on spotlight, type terminal to open a terminal window. Enter the startup folder by typing cd /some_folder_name. 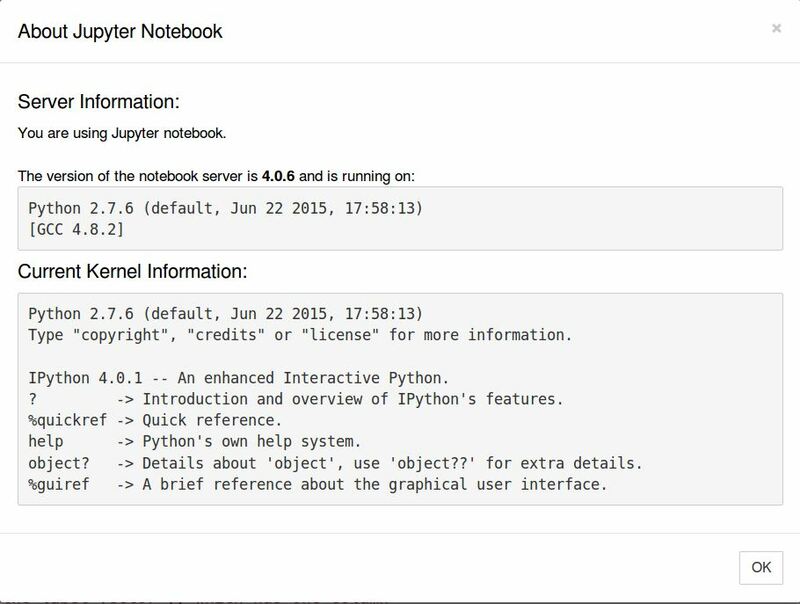 Type ipython notebook to launch the Jupyter Notebook App (it will appear in a new browser window or tab). profile 생성없이 defalut내용을 바로 변경한다. 전체 Jupyter에 영향을 미친다. jupyter_notebook_config.py를 열어서 아래의 내용을 입력한다. 패스워드를 사용할 때 SSL을 사용하는것은 좋은 생각이다. SSL을 이용해서 브라우저에서 패스워드가 암호화되서 보내지기 때문이다. 이를 위해서 self-signed certificate를 생성 한다. OpenSSL을 이용해서 certificate을 생성할 수 있다. 유효기간은 365일이다. 서버 설정 내용을 jupyter_notebook_config.py를 열어서 아래의 내용을 입력한다. # The IP address the notebook server will listen on. 또는 아래의 명령어로 수작업으로 설정해 줄수도 있다. 명렁어 --config jemin_config.py를 설정해 준다. [I 00:46:15.432 NotebookApp] Use Control-C to stop this server and shut down all kernels (twice to skip confirmation). #실행과 동시에 web-browser를 실행하지 않게 한다. c.NotebookApp.matplotlib='inline' 옵션은 사용하지 못하도록 변경되었다. IPython shell에서 직접 magic 함수를 이용해야 한다. 버전어 맞춰서 아래 명령어를 이용한다. terminal window를 유지하지 않아도 connection이 보장된다. 프로세스가 백그라운드에서 지속적으로 실행하도록 함. 물론 그냥 &만 뒤에 붙여주면 shell에서 백그라운드로 동작하지만 terminal을 닫으면 프로세스가 terminate되기 때문에 보장되지 않는다. 이렇게 실행한 프로세스는 kill로 terminate해야 한다. [W 20:34:44.745 NotebookApp] Unrecognized alias: '--profile=jemin_config.py', it will probably have no effect. config file에서 아래의 SSL 설정관련 코드들이 문제가 된다. 보안상 문제가 있지만 그냥 주석처리하고 실행 한다. [W 22:43:24.515 NotebookApp] Unrecognized alias: '--profile=jemin_config.py', it will probably have no effect. [I 22:43:24.545 NotebookApp] Use Control-C to stop this server and shut down all kernels (twice to skip confirmation). 이 부분과 관려해서 궁금한게 있어서 글 남깁니다. 저의 경우 Pychram을 통해서 주피터 노트북을 연결할때 'Authenticaton token' 을 입력해 달라고 나옵니다. pycharm에 연결되어있는 http://127.0.0.1:8888 로 들어가 보면 비밀번호를 요구하고요. 문제가 발생합니다 . 어떻게 하면될까요?? Pycharm으로 하실경우 설정을 다르게 해야할것 같습니다. 제가 설명 드린 방법은 jupyter notebook configuration을 건드리는 방법이라서 pycharm으로 실행 할 때는 계속해서 token을 입력하고 메시지가 나올 수 있습니다. 저는 그래서 그냥 py 파일로 구조적으로 개발할 때 pycharm을 쓰고 notebook 스타일로 할 때는 jupyter를 사용합니다. 간단한 것들을 확인 할 때는 주피터를 쓰고 이제 그것을 좀 체계적으로 모듈이나 클래스화해서 작성 할때는 pycharm을 쓰는 상황입니다. 안녕하세요 주피터 서버를 설치 따라해봤는데요. 보통 IPython 재 설치후 해결이 되었다고 하네요. 으로 한번 해보심을 추천 드립니다. 이상한 현상이 있어 문의 합니다. 설치 후 주피터노트북 잘 됩니다. 하지만 PC를 재부팅하면 주피터노트북이 안됩니다. 그럼 다시 파이션/텐서플로우/주피터노트북 삭제 후 재설치 하면 됩니다. 그리고 재부팅하면 주피터노트북만 또 안됩니다. [I 07:53:41.222 NotebookApp] Use Control-C to stop this server and shut down all kernels (twice to skip confirmation). "User-Agent": "Mozilla/5.0 (Windows NT 10.0; Win64; x64) AppleWebKit/537.36 (KHTML, like Gecko) Chrome/62.0.3202.94 Safari/537.36"
컴퓨터를 포멧하면서 다시 세팅을 하는중인데요. jupyter server 는 locall ip 로만 실행되네요..
config 에서 수정하거나 jupyter-notebook --ip=118.... 이렇게 치면 에러가 납니다. 으로 하면 외부에서 외부IP:port 치고 들어가집니다.